Background. Chronic pain after inguinal hernia repair is often due to nerve injury by penetrating mesh fixation devices, such as staples, tacks or sutures. The cumulative incidence of pain, numbness and discomfort after surgery for inguinal hernia is reported to be as high as 30%. Tissue sealants have been proposed to provide atraumatic mesh fixation until fibrous incorporation of the implant into the abdominal wall occurs. In several studies on hernioplasty, punctual mesh fixation with fibrin sealant (FS) proved to be efficient in terms of fixation strength and elasticity, but seroma formation was reported in certain cases as a relevant potential side effect. 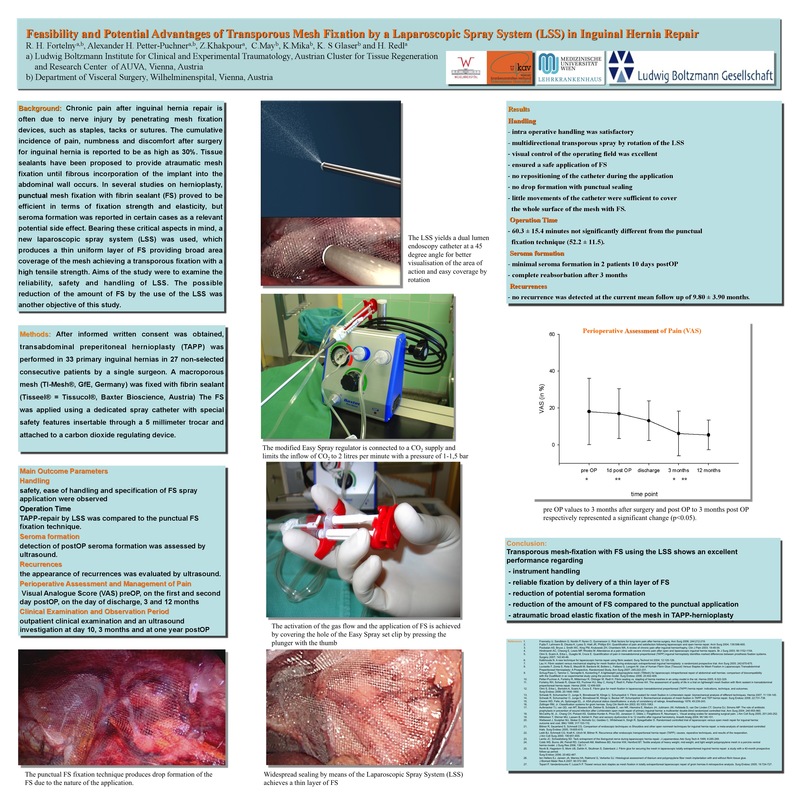 Bearing these critical aspect in mind, a new laparoscopic spray system (LSS) was used, which produces a thin uniform layer of FS providing broad area coverage of the mesh achieving a transporous fixation with a high tensile strength. Aims of the study were to examine the reliability, safety and handling of LSS. The possible reduction of the amount of FS by the use of the LSS was another objective of this study. Methods. After informed written consent was obtained, transabdominal preperitoneal hernioplasty (TAPP) was performed in 33 primary inguinal hernias in 27 non-selected consecutive patients by a single surgeon. A macroporous mesh (TI-Mesh®, GfE, Germany) was fixed with 1 ml of fibrin sealant (Tisseel® = Tissucol®, Baxter Bioscience, Austria) The FS was applied using a dedicated spray catheter with special safety features insertable through a 5 millimeter trocar and attached to a carbon dioxide regulating device. Results. The intra operative handling was satisfactory. The mean operation time of 60.3 minutes (±15.4) was comparable to staple fixation and punctual FS application in TAPP. The formation of a thin layer of FS led to a 50% reduction in the amount used FS compared to punctual application. Conclusions: This LSS provides an atraumatic broad elastic fixation of mesh in the TAPP-hernioplasty, allowing an easy and excellent fixation accompanied by a reduction of the amount of FS required. It could therefore help to simplifly application and to reduce costs also compared to mechanical fixation and avoid potential seroma formation as described for punctual FS application.